The basic idea in the Montessori philosophy of education is that all children carry within themselves the person they will become. In order to develop physical, intellectual and spiritual potential to the fullest, the child must have freedom: a freedom to achieve through order and self-discipline. Dr. Montessori developed what she called the Prepared Environment, which already possesses a certain order and allows children to learn at their own speed, according to their own capacities and in a non-competitive atmosphere. "Never let children risk failure until they have a reasonable chance of success." If Montessori children are free to learn, it is because they have acquired an "inner" discipline from their exposure to both physical and mental order. This is the core of Dr. Montessori's philosophy. Social adjustment, through a necessary condition of learning in a schoolroom, is the purpose of education. Patterns of concentration, "stick-to-itiveness" and thoroughness, established in early childhood, produce a confident, competent learner in later years. 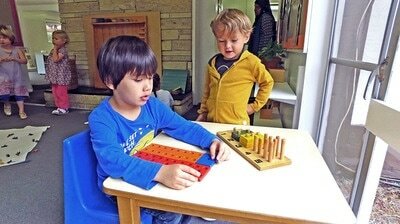 Montessori teaches children to observe, to think, to judge. It introduces children to the joy of learning at an early age and provides the framework in which intellectual and social discipline go hand-in-hand. The main objective of the Ross Academy Montessori School is to provide a carefully planned, stimulating environment which will help children develop within themselves the foundational habits, attitudes, skills and ideas which are essential for a lifetime of creative thinking and learning. To develop a positive attitude towards school and learning. To develop a sense of high self esteem. To develop habits of concentration for life-long study skills. To develop and foster an abiding curiosity. To develop habits of initiative and persistence. ​To develop sensory motor skills in order to sharpen the ability to discriminate and judge. To develop socially acceptable behavior. To acquire the basic skills necessary for a lifetime of learning. To help develop each child's innate ultimate potential through high self expectations. in a happy, creative environment"